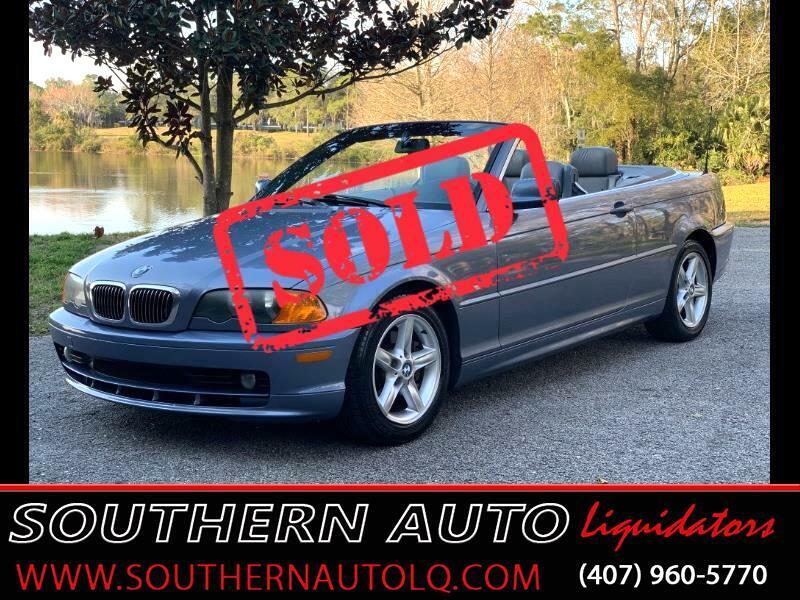 Check out this Beautiful 2002 BMW 325ci convertible. If you have been on our website before, you may have noticed that we almost always have a 3-series BMW in our inventory. This is because it is definitely one of our favorites in terms of looks, speed and regarding their endless driving pleasures. Leave it at this: The 3-series remains the finest mid-size sporting two-door on the planet. Now add to that a fully lined Soft-Top with glass rear window and electric rear And it just doesn't get better than that. This 325ci is in absolute beautiful condition and I love Dark Blue Soft Top. I love this part of my job: The test drive... Wow, this car flows smoothly though the gears, it loves the road, hugging the curves. BMW uses inline six-cylinder engines instead of V6s. Though it takes up more space, an inline-6 is has its strengths in terms of operational performance. Indeed, BMW believes that six pistons lined up in a row run more smoothly than two banks of three pistons arranged in a V, and we agree. The BMW 325Ci features a 2.5-litre engine with 24 valves, DOHC, variable valve timing, and six cylinders. All of these points factor into a resulting 184 horsepower for an exuberant highway drive. The interior is super clean. This BMW's Equipment includes adjustable power front seats with driver's position memory electronically tagged to the key, remote keyless entry, power windows, cruise control, Myrtle wood trim, cabin-air filtration, fog lights, leather seating, includes fully automatic soft top, , xenon lights with halo, sport leather steering wheel, AM/FM/CD Radio. Steering Wheel Controls, ABS Brakes, Ice Cold Air Conditioning, Alloy Wheels, Traction control w/Dynamic Stability Control, Hartman Kardon Sound System, Cruise Control, Heated Seat, Power Locks, Power Mirrors, automatic climate control, privacy glass, front reading lights, footwell lighting, it really does have it all. This is a fully lined Soft-Top with glass rear window and electric rear defroster. Plus, with automatic climate control and heated seats, you can enjoy this experience any time of the year. But modern features don't just mean adding technology and luxury; it also means superior safety. This includes front airbags, side airbags, and anti-lock brakes and Rollover Protection System. Just because the top comes down shouldn’t mean your safety standards do as well. BMW added reinforced bars behind the headrests on the back seats that are barely noticeable. Rollover Sensors monitor vehicle movements, and in the event of an accident, the bars rise up above the height of the headrests to protect you in a roll-over. The BMW 3-series is a special mix of sporting performance, practicality and European luxury in a compact package. This BMW 3 series offers excellent handling, performance and smooth quiet drive. Steering is sharp and responsive. This 325 is exceptional. Come see for yourself! Drive Safe. Drive Fun. Drive Cool!